I'd heard rumors that the Kim's Club near Gangnam Express Terminal held a secret stock of real French cider. You know, the proper stuff, beer made with apples... fizzy alcoholic appley goodness. 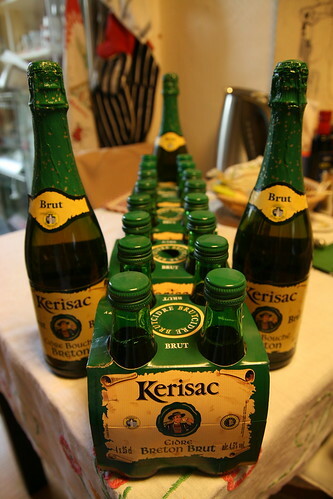 So I took a trip down to the wine section and there they were, those beautiful green bottles of Breton goodness. Large bottles are 5,000 won each (with a choice of dry or sweet) and the small bottles (25cl) are four for 7,900 won (dry only). Now I just need some pork, some cream and plenty of mushrooms for a Breton/Norman apple extravaganza.